What I love so much about readng the Giller books is that there are always surprises. I’m often reading books I hadn’t heard of before, books from authors I’ve never read before, and books I know very little about. Add the fact that the books have been carefully chosen by a handful of smart and interesting judges, and you can be in for some unexpected treats. Bellevue Square was one of the books I knew very little about when I went into it. What I found was a clever, complex story that took me on endless twists and turns. Bellevue Square tells the story of a woman (Jean) who hears from two different people that she has a doppelganager out there. She becomes obsessed with finding this woman who supposedly looks just like her, and starts hanging out at the park near Kensington Market. Here she meets several colourful characters, and starts canvassing them for their help in spotting her double. You can look at yourself in pictures or even on video, but you still don’t have the experience others do of you in the world. I really can’t say much more about the plot without giving things away, other than to say the story includes disappearing people, mental illness, parenting, a bookstore, and a literary festival in the woods. I thought the writing was whip-smart, including the banter and dialogue between Jean and her children, giving us moments of normality amidst all the confusion. One small bone to pick would be that I wanted more from the husband; for someone so close to the protagonist, I found that he seemed too distant. But this could also be a symptom of how distracted Jean had become by her obsession with the doppelganger. I remember standing in the mirror as a child, staring into my own eyeball. I lined one eye up against its reflection and shut the other. I saw a slippery black void but that’s where I was: in that void. My face was wrapped around muscle and bone. Before Ingrid, it was my face alone. Now I exist as myself only inside my own dark eye. Torontonians should enjoy the setting of the story. Even I could picture myself sitting in the park watching the foot traffic go by in Kensington Market. I feel as though if I went there now, I might bump into Jimmy or Miriam handing out the milk. Kensington Market’s energy was hustle too, plus bustle, a lot of movement right in front of your eyes, and a shudder or rattle behind it. Countercultural, but bloody and raw. The organic butcher beside a row of dry-goods shops offered, in one window, white-and-red animal skulls with bulbous dead eyes, and in the other, closely trimmed racks of lamb and venison filets, displayed overlapping each other like roofing tiles. Then some stranger rustles past with blood on his cheeks. Torontonians wanted to get on with it, but they were generally courteous. if someone let you into a car lane, for instance, you were expected to wave with casual gratitude, like you expected it, but thank you anyway. Toronto’s panhandlers thank you when you give money, and also when you say “Sorry.” In fact, “Sorry, thank you,” may be the most common exchange between citizens. Toronto’s reputation when I lived outside it was that it was a steely, arrogant place without a heart, but now I see it likes outsiders and it draws on a deep spring of weirdness. 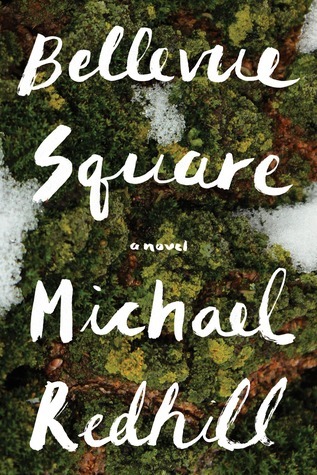 I found Bellevue Square to be a page-turner; interesting, complicated, stimulating, creepy, and unique. At times I was confused, at other times I thought I knew exactly what was going on… only to find out I was wrong… probably. But really it’s hard to know for sure because this book is only the first of a trilogy. “Mental illness, parenting, a bookstore, and a literary festival” — sign me up! I’ve read several excellent reviews of this but the only copies available in the U.K. are extremely expensive and have a delivery date of at least a month. I shall have to put it on my want to read list and hope that it soon becomes more accessible. How frustrating. Let’s hope it doesn’t take long! Yes; I had to ship my copy from Canada at outrageous expense. But it turned out to be such a terrific read I didn’t mind. That’s a lot going on there, but the idea sounds intriguing. I felt really confused at times… but in a good way. (Can there be a good way of feeling confused? Well, there is now.) It makes me wonder what it was like for him to write it. A literary festival in the woods? this is the first I’ve heard of this mentioned in reviews on this book-now you’ve got me intrigued! I really loved this book. I think it has been very cleverly written / plotted / structured but, as you say, it’s difficult to review without giving things away. Definitely scary for some of the characters! I don’t think I’ve heard of any of the books you’ve been reading for the Giller shortlist before seeing them on your blog, so I’m enjoying learning about them. This one sounds particularly good to me, both because of your review and because the cover and general idea are fascinating to me. If you’re interested in the idea, then I don’t think you’d be disappointed. Unless you don’t like to feel confused while reading. For this book, you just have to let yourself feel confused – it’s part of the fun! Oh this sounds so good! I don’t mind being confused as long as I am intrigued! Do you feel like this book NEEDS to be a trilogy, or does it seem like the author/publisher has jumped on that bandwagon: write a trilogy and hope to get a three-movie deal? Good question. I wonder that every time I see a trilogy coming out. I guess the answer kind of depends on what the next two books are like. Will there be some kind of shift or gap between books? The Maddaddam trilogy is a good example of a trilogy with three distinct books. Or will the story just continue, with the only benefit being to avoid one great big book? I almost feel like the MaddAddam books could each be read as a standalone. So good. Gotta try a sample! Thanks!! I’m sold Naomi! Love novels that defy genre categorisation, and such great writing. On my wishlist for the paperback or ebook release. This book takes you for a wild ride. And it’s well-written and funny, too. I used to live in an apartment building where our alleyway led to Bellevue Square, so I am eager to read it. (I’m waiting for the paperback which comes out Sept. 18th). I love the excerpts you chose for your post. Re panhandlers, it’s true! I always say “Sorry” when I don’t have spare change, and invariably the reply is “That’s okay. Have a good day.” I just signed up for your blog and am enjoying it very much. Hi Craig! I’m hoping you will really enjoy the book, especially since you know the area well. I like being familiar with the setting of a book. Thank you for signing up, and I hope you continue to visit and enjoy!